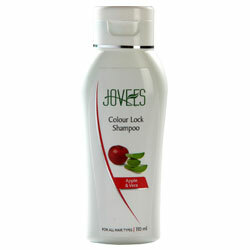 Aloevera & Apple Colour Lock Shampoo has 'light-reflecting' qualities to leave hair soft, shiny, easy to manage. A scientifically developed natural shampoo for hair that is colour-treated to enliven it with vibrant radiance. Chemicals, by their very nature, are damaging to the hair cuticle - this natural shampoo shall help to preserve the longevity and radiance of colour-treated hair. It shall also give strength to the hair roots, detangle and condition hair. Moreover, it has 'light-reflecting' qualities to leave hair soft, shiny and easy to manage. Aloe Vera ext, Apple ext, Bhringraj, Wild cherry bark, Myrrh.